Milton Keynes council, with its contractors Ringway, designed and constructed the hub as part of its Go Ultra Low city programme. 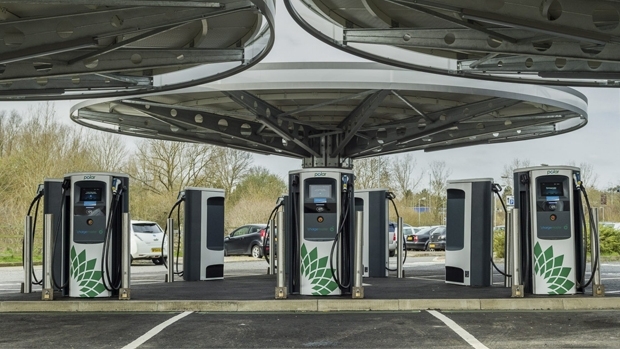 The country’s largest EV universal rapid charging hub has been inaugurated by Milton Keynes council and BP Chargemaster, which is operating the hub on Polar, the largest public charging network in the UK. Funding for the project came from the Office for Low Emission Vehicles (OLEV), as part of a £9m investment package to support the growth of electric vehicles in Milton Keynes. The site, with eight 50kW rapid chargers supporting all standards of EV rapid charging, has already been used to charge more than 500 electric vehicles since it went live, and the inauguration event saw eight modern electric cars using the hub. “The rapid charging hub is just one of the ways in which we are supporting electric vehicle drivers in Milton Keynes, with other initiatives including free parking with a Green Permit in most car parks, and our pledge to provide local charging points for residents who do not have off-street parking”, said head of transport Innovation at Milton Keynes council, Brian Matthews. “The eight UK-made Ultracharge rapid chargers join the 300 Fastcharge and 65 rapid chargers that we already operate in the area, which has established itself as a centre of excellence for electric vehicle charging infrastructure”, commented chief executive of BP Chargemaster, David Martell.